Not sure if its the fastest but its the most readable solution to me since it doesn't rely on anything but list comprehensions. I tried a test with the same data, using itertools.chain.from_iterable : $ python -mtimeit -s'from itertools import chain; l=[[1,2,3],[4,5,6], , [8,9]]*99' 'list(chain.from_iterable(l))'. It runs a bit more than twice as fast as the nested list comprehension that's the fastest of the alternatives shown here. @BorisChervenkov: Notice that I wrapped the call in list() to realize the iterator into a list. numpy.concatenate seems a bit faster than any of the methods here, if you are willing to accept an array. @Noio It makes sense if you re-order it: [item for item in sublist for sublist in l ]. Of course, if you re-order it, then it won't make sense to Python, because you're using sublist before you defined what it is. [leaf for tree in forest for leaf in tree] might be easier to comprehend and apply. @wim I really just write the for loop structure out in full if i'm not sure what a list comprehension is doing. Though I will grant that at face value item for sublist in l for item in sublist sounds like nonsense. the reduce example in the main text use the + operator, and therefore create N list. 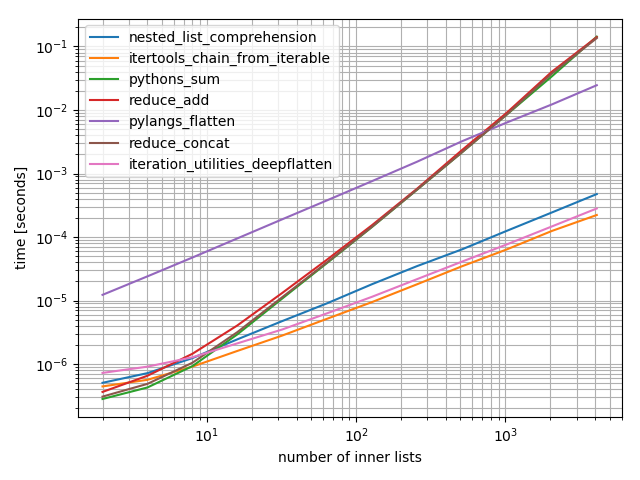 reduce(lambda x, y : x.extend(y) or x, ll, ) is much faster than list comprehension in my test. The tricky part is the expression : x.extend(y) return None, so we use or to get the accumulator list extended : a or b return b if bool(a) evaluate to false. @AlexMartelli Can you suggest whether this would still be the best option if all sublists are the same length (in my case length 2)? @Joel, actually nowadays list(itertools.chain.from_iterable(l)) is best -- as noticed in other comments and Shawn's answer. Sorry to revive this very old thread, but I was curious why this solution is the best. If I'm reading the timeit output correctly, each loop of this solution runs roughly 10 times faster, but 10 times more loops are required. @JuanXarg, nope, you're totally misunderstanding timeit's output: it iterates 10 more times because it can (within the rough constraint of taking about the same amount of elapsed time), not because the iterations are in any way, shape, or form, "required". Any sublist that is not actually a list but an str would get split too, anyway to dodge that in a pythonic way? I don't care about how fast it runs as long as it's hard to understand!!! Can anyone tell me he/she can remember the syntax 3 months later without referring to this same post again? Can anyone tell me why you need to repeat item for sublist? Ugly Ugly Ugly!! Why all the upvotes? reduce(operator.concat, list2d) is faster AND easier to understand! See this answer. I have tried to put parentheses to clarify the associativity of these (nested?) generators.. but I fail so far. None of list(i for a in ([[1, 2], [3, 4]] for i in a)) and list((i for a in [[1, 2], [3, 4]]) for i in a) compile, but give syntax errors. I understand that the latest a refers to the first a introduced there. So I assumed that the expression must be left-associative. But the latter fails to parse aswell. Any hint to this? @JohnMee: [leaf for leaf in tree for tree in forest] would have been even better and much easier to read but sadly, Python devs didn't think so. At first the [leaf for tree in forest for leaf in tree] syntax seems confusing and in the wrong order, but its the same as a nested for loop, except the yield leaf is moved to the front so it fits the list comprehension standard. e.g. for tree in forest: for leaf in tree: yield leaf . The other suggested syntax order [leaf for leaf in tree for tree in forest] seems much more like piping or composition rather than nesting so yeah from that perspective it's easier to reason about that deep nesting. I wish there were something like R's magrittr package for piping functions together in Python. It's generally easier to read from left to right rather than from inside out, although perhaps that's a very biased perspective from someone who natively writes a left-to-right language like English. @AlexMartelli You said "nowadays list(itertools.chain.from_iterable(l)) is best". Can you add that to the top of your answer, with a link to a better answer? Your answer has so many upvotes that it seems authoritative! @AlexMartelli, doesn't work on lists like [1,2,[3,4]] as pointed out by Sven above. A list inside a list won't work @AlexMartelli as they aren't iterable. See Nadia's reply below, too. This appears to be the fastest solution. that's pretty neat and clever but I wouldn't use it because it's confusing to read. @Nick: It's not immediately clear that you can do this. Even though + is overloaded, the sum function is implemented in C. I believe it has only recently been changed to support non number objects. This is a Shlemiel the painter's algorithm joelonsoftware.com/articles/fog0000000319.html -- unnecessarily inefficient as well as unnecessarily ugly. @ThomasAhle, I think you might be be confused. @andrewrk Well, some people think that this is the cleanest way of doing it : youtube.com/watch?v=IOiZatlZtGU the ones who do not get why this is cool just need to wait a few decades until everybody does it this way :) let's use programming languages (and abstractions) that are discovered and not invented, Monoid is discovered. this is a very inefficient way because of the quadratic aspect of the sum. This doesn't seem to work in python 2.7, unless I'm doing something wrong. When I'm dealing with strings: TypeError: can only concatenate list (not "str") to list When I change it to ints, I get the same error but s/str/int/. I was assuming 'sum' is a standard operator... ? So.. this is perfectly fine for short cases, then? Thank you, this is amazing. Things like this make me love Python lol. Best. 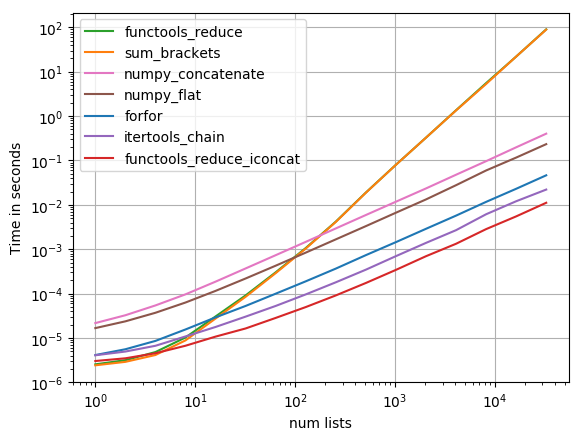 For huge nested lists,' list(numpy.array(a).flat)' is the fastest among all functions above. This works with abitrarily nested lists. It can be easily extended to work with other kinds of iterables. You are indeed right +1, ᴡʜᴀᴄᴋᴀᴍᴀᴅᴏᴏᴅʟᴇ3000's proposal won't work with multiple digit numbers, I also didn't test this before although it should be obvious. You could simplify your code and write [int(e.strip('[ ]')) for e in str(deep_list).split(',')]. But I'd suggest to stick with Deleet's proposal for real use cases. It doesn't contain hacky type transformations, it's faster and more versatile because it naturally also handles lists with mixed types. Thanks! This was of course supposed to be funny. I've seen Deleet's proposal in a python book before. Can you tell us which book? I contemplated a lot about this because it's so effective and beautiful. Will hit recursion limit inevitably in general but for cases like this with few recursions it seems perfect. @MartinThoma Much appreciated. FYI, if flattening nested iterables is a common practice for you, there are some third-party packages that handle this well. This may save from reinventing the wheel. I've mentioned more_itertools among others discussed in this post. Cheers. Nice - was just wondering about a yield from type of construction on python after learning about yield * in es2015. replace by if isinstance(el, collections.Iterable) and not isinstance(el, (str, bytes)): to support strings. Maybe traverse could also be a good name for this way of a tree, whereas I'd keep it less universal for this answer by sticking to nested lists. You can check if hasattr(x, '__iter__') instead of importing/checking against Iterable and that will exclude strings as well. sum no longer works on arbitrary sequences as it starts with 0, making functools.reduce(operator.add, sequences) the replacement (aren't we glad they removed reduce from builtins?). When the types are known it might be faster to use type.__add__. @YannVernier Thanks for the information. I thought I ran these benchmarks on Python 3.6 and it worked with sum. Do you happen to know on which Python versions it stopped working? I was somewhat mistaken. 0 is just the default starting value, so it works if one uses the start argument to start with an empty list... but it still special cases strings and tells me to use join. It's implementing foldl instead of foldl1. The same issue pops up in 2.7.
reduce(operator.add, l) would be the correct way to do the reduce version. Built-ins are faster than lambdas. this can use only for integers. But what if list contains string? @Freddy: The operator.add function works equally well for both lists of integers and lists of strings. I tried reduce with operator.concat on a list of 1,000,000 integer sublists of lengths 1-10, and it never returned (after 1 minute). The list comprehension, operator.itertools and a simple list.extend over loop all returned in sub-seconds. The last method was the fastest! You can avoid recursive calls to the stack using an actual stack data structure pretty simply. This doesn't support iterable collections other than lists. You might want to consider using isinstance(temp, Iterable) like some of the other examples. I think you can also simplify this a bit, if you add alist to templist at the beginning, you should only need the nested while loop. You could also use a queue data structure in order to avoid reversing the entire list at the end. I'm not sure what you achieve by downvoting a comment that identifies a flaw in your answer. The voting system is here to help others save their time using answers that work. Yours works only partially as indicated above and makes an assumption on the input being non-flat and doesn't generalize. Similarly, you can use pydash. I find this version to be much more readable than the list comprehension or any other answers. Thanks for the approach. I have one comment on your keyword a. Mutable default args have side effects and are often avoided in Python. The link has a solution for this. Cheers.